I love summer, so much. During the winter I whine and pout about the cold short days for weeks on end. But summer? Summer's my boo. 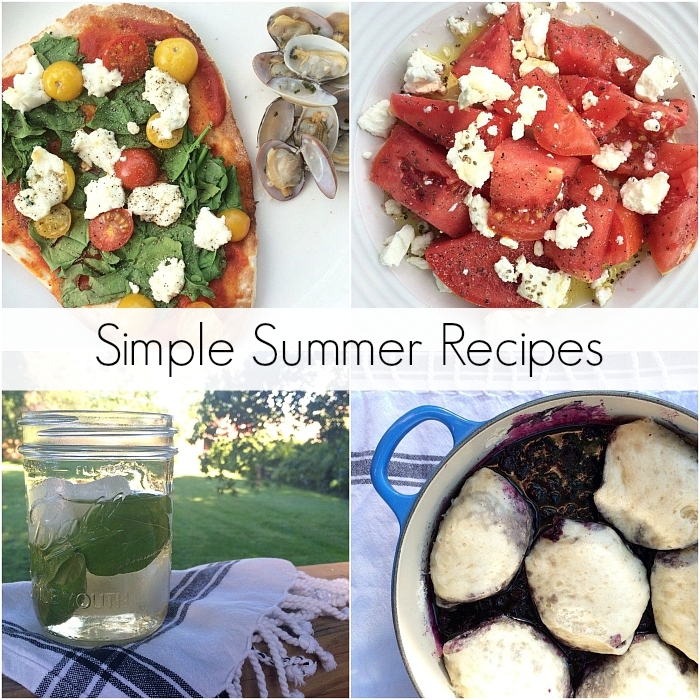 One of the many, many reasons I love summertime is the seasonal food. I love how easy and relaxed yet indulgent summer eating is. We try to keep a few key ingredients on hand (like tomatoes, goat cheese and olive oil) which makes throwing together meals after work a snap. If you're following me on Instagram, you've seen these pics over the past few weeks. This post just gives a little more detail about each recipe, although I'm using the term "recipe" loosely, since most of these are a "to taste" situation. Enjoy! I love to make grilled pizzas on weeknights because it's fast, doesn't heat up the house and our kiddo loves to help sprinkle on the ingredients. There are thousands of ingredient combinations, but the one above is currently my favorite. We prepare the pizzas on a cookie sheet lined with parchment and then cook 'em up on the grill on low heat until they are heated through and the cheese starts to melt. This is a new one and I am obsessed with it! I bought a jar of Smoked Alderwood Salt while visiting NYC and I can't stop putting it on everything. Everyone is getting a jar of this magic stuff for their next birthday/housewarming/baby shower/bar mitzvah/bachelor party/graduation. For this recipe, just chop up a bunch of tomatoes, drizzle with olive oil, sprinkle on some chevre and smoked salt and dig in. With a little bread on the side (carbs 4eva!) it's a perfect little lunch. I'm more of a wine gal, but during the summer I like an icy cocktail once in a while. For this drink, mix up one ounce of vodka, your preferred ginger ale, ice and a couple basil leaves. Voila. Summer in a glass! I also like to use mason jars as glasses for just about everything, even wine, because they are pretty hard to break and you can pop a lid on them for easy transport (you know, for iced tea...yeah). Ice - lots of it! What could be easier or more delicious than blueberries and biscuits topped with with vanilla ice cream? Nothing, that's what! I love the recipe from Port and Fin, but I cheat by using store bought biscuit dough.